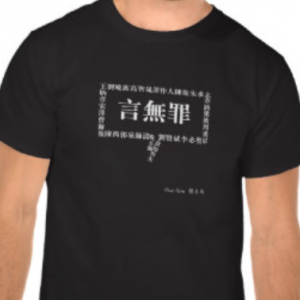 Editor’s Note: The Word of the Week comes from China Digital Space’s Grass-Mud Horse Lexicon, a glossary of terms created by Chinese netizens and frequently encountered in online political discussions. These are the words of China’s online “resistance discourse,” used to mock and subvert the official language around censorship and political correctness. 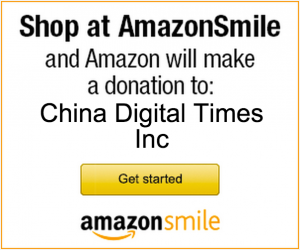 If you are interested in participating in this project by submitting and/or translating terms, please contact the CDT editors at CDT [at] chinadigitaltimes [dot] net. 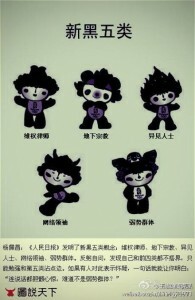 The new five black categories depicted as the 2008 Beijing Olympics mascots. During the Cultural Revolution, the five black categories referred to five political identities: landlords, rich farmers, anti-revolutionaries, bad-influencers and right-wingers. With ‘Internet freedom’ as its slogan, they [the Americans] will attack ‘top down’ governance in order to push forward the traditional model of liberal democracy; through the use of ‘rights lawyers,’ underground religion, dissidents, internet leaders and disadvantaged social groups as the core forces, they will push for a ‘bottom-up’ approach to Chinese governance from the grassroots to lay a foundation for changing China.